Re. Assignment of H. C. Alger Interest - CODY. 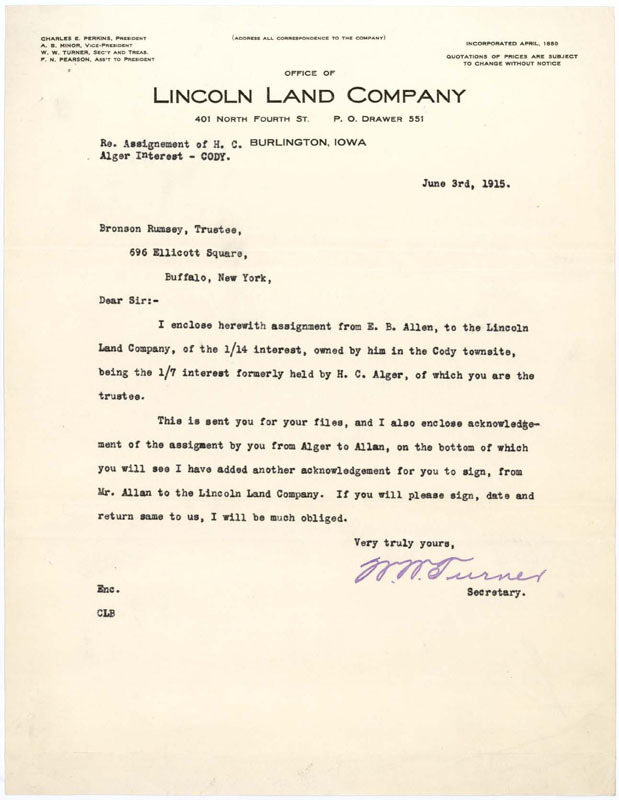 I enclose herewith assignment form E. B. Allen, to the Lincoln Land Company, of the 1/14 interest, owned by him in the Cody townsite, being the 1/7 interest formerly held by H. C. Alger, of which you are the trustee. 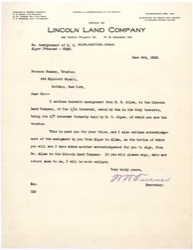 This is sent you for your files, and I also enclose acknowledgement of the assignment by you from Alger to Allan, on the bottom of which you will see I have added another acknowledgement for you to sign, from Mr. Allan to the Lincoln Land Company. If you will please sign, date and return same to us, I will be much obliged.